PLEASE REVIEW POST 44 IN THIS THREAD IF YOU PLAN TO BUILD THIS YOURSELF FROM MY DRAWINGS. I build a lot of things instead of buying - within reason, and then sometimes without reason. I just like doing a lot of different things in a project. It's why I'm building an 818 - to do instead of buying "done". These days a lot of people who would never get into electronics, are doing so, with just a little info to get them going. This is not really a complex circuit by any means. If you have just a bit of skill, or an 'electronics type' friend who wants to help, or even a high-school kid who wants to learn and try it - I say go for it. I haven't done a PCB board for this yet but will, and will post up a drawing for that. It can be done just on a piece of perf board, etc. for that matter. I did the breadboard setup and tests, with several of the LED lights listed below, from Amazon. Also verified it works with the standard Subaru 3 terminal flasher module, with LED's. (in the olden days flasher modules often needed the "load" of incandescent lamps to do the flashing - hence I tested it). This would get in trouble running incandescent bulbs, or LED's drawing much over a total of 300mA (Q1 would get HOT at least if not fail). Other transistors (must be reasonably equivalent in characteristics to these) can be used, these are the ones I had in my junk boxes. With "turn signal off", Q2 is off, allowing Q1 to turn on. 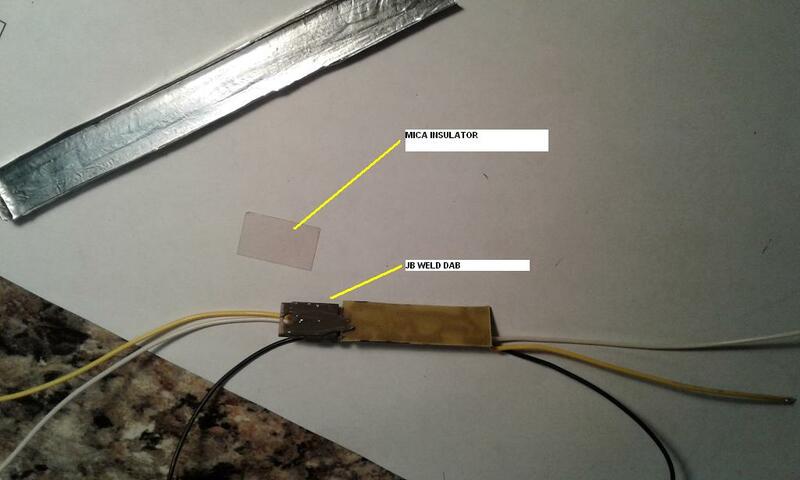 This lights the white LED's connected to Q1. 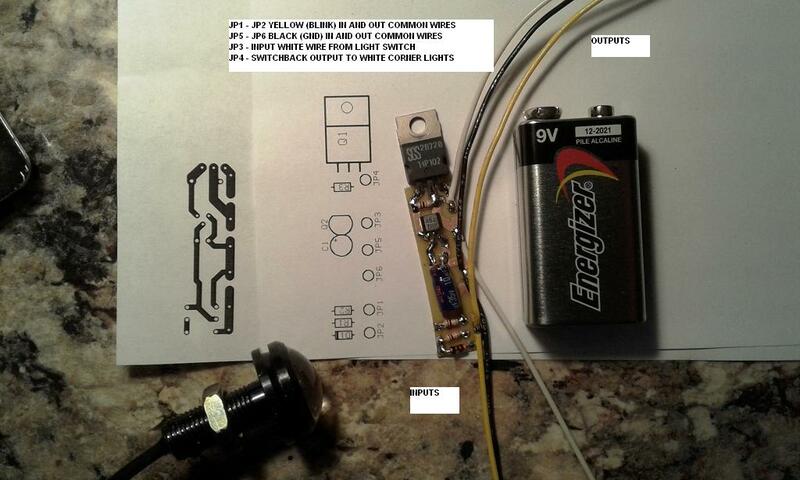 When turn signal is energized, the Yellow LED's light by direct wiring through the flasher 12V. Also this turn signal 12V almost instantly charges capacitor C1 via diode D1 and low ohms resistor R1. The 12V at C1 and the gate of Q2 turns on Q2. Q2 turns off Q1 so the white LED's are turned off instantly. Once the turn signal is off, the high resistance in R2 begins to discharge C1. The resistance/capacitance time constant of R2, C1 takes about 2 seconds to discharge enough that Q2 can turn off. By this time a blinking turn signal has recharged C1 repeatedly so Q2 remains turned on. After the blink condition ends, C1 will finally be able to discharge until Q2 turns off, allowing Q1 to turn back on and resume the running white LED mode. 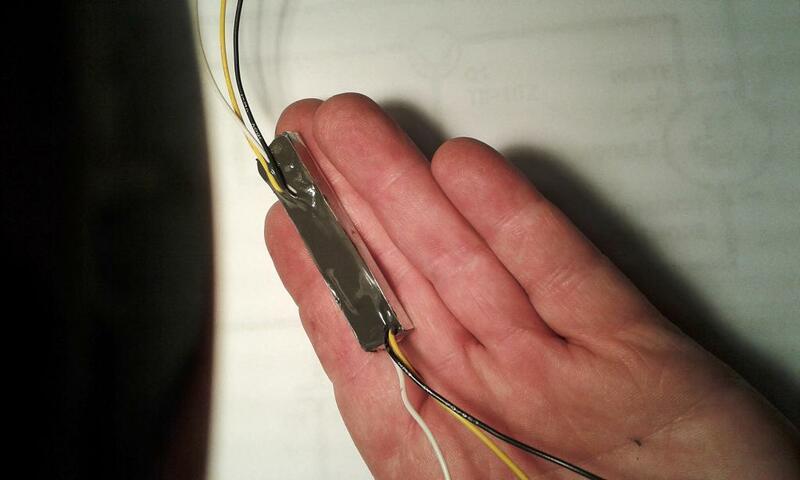 With 6 each of some 50 milli-ampere white LED's connected to Q1 it can get slightly warm, so packaging of the circuit (pot in epoxy for example), should be such that it can dissipate some heat, about 1/4 to 1/2 watt is typical. Also the Q1 transistor case must be insulated from ground, etc. The LED's I tried were pointed out in another post here, I bought them and like them. Yes tiny wires, but that is all they need for the current demand in play. One way to package this might be in an Altoids box, or a cigar tube, then pot (filled) the container with some JB Weld. 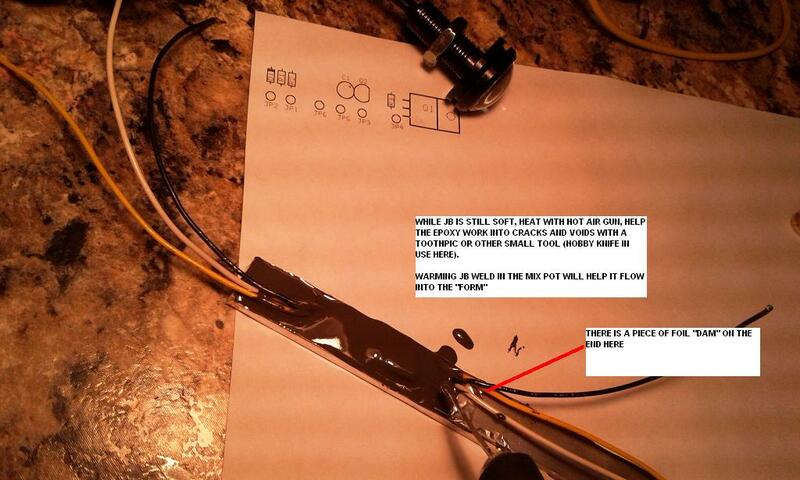 I believe JB Weld has metal filler but not to the point of being conductive enough to affect this circuit. The Q1 should be close to the surface of the container so it can pass heat out, but not touching. JB will move the heat out fairly well. If you get to fancy it finally reaches the point where buying a couple commercial modules would make more sense. But then you didn't build it yourself (818 wink). Art, this is perfect, thank you for the schematic and the explanation behind how it works. Time to go scrounge in the scrap bin! I am in the middle of building a similar circuit using p chan mosfet. draw about 60 ma ea. Going to use them anyway since hard to find any others. .may mean like a old regular bulb. I also have adj delay. Like the circuit. Last edited by frankc5r; 01-05-2017 at 09:36 AM. The comment about 9 Watt - I suspect that was for all the lamps in the package as sold. Or more likely 0.9 Watt typo'd into 9 Watt. Definitely about 60mA at 13.8Vdc though and that is of course what we need to know. But they are VERY bright for just 1watt! Very efficient LEDs, their lumens per watt must be very high. How about replacing Q1 with a 2N3055 power npn transistor? Takes up a little more space but with significant more power capacity. I'll toss one on the breadboard and see how it behaves. I share the thrill of trying new projects and I need my LED turn signal lights to work right, but I'm an electronics dummy. When the rest of you are digging into your scrap bin for parts, I had to look up PCB and perf board in Google! I have found all the parts in Amazon but can you show me how to put them together on a board? Can I fill the Altoids box with epoxy or will JB Weld dissipate heat better? 818S/C : Chassis #25 with 06 WRX 2.5 turbo, ABS, cruise, PS, A/C, Apple CarPlay, rear camera, power windows & locks, leather & other complexities. Mk3 Roadster #6228 4.6L, T45, IRS, PS, PB, ABS, Cruise, Koni's, 17" Halibrands, red w/ silver - 9K miles then sold @ Barrett-Jackson Jan 2011 (got back cash spent). Last edited by frankc5r; 01-07-2017 at 04:15 PM. Frank, what difference in trust are you thinking about between your circuit and Alex's? We will see. I am going to build it tomorrow and test it with multiple displays, measure temp rise, current draw etc. Alex is an experienced designer. I know enough to be dangerous!! I did a PCB layout and put one of mine together this evening. Ran 8 lamp sets on it, 400ma load. It runs about 1/4 watt out of the Q1 darlington transistor. Then potted it in JB weld. Will play again tomorrow evening. In a good heatsink it would handle a couple amps - ie. regular lamps, but that is not what my project is about. Driving the LED's is enough and it will do that skating along. Regarding using 2N3055. It needs a darlington transistor in my design, so that is not a fit, but not needed for LED's either. Thanks for the info. Going to try it! So here is my first assembly. Uses the schematic I posted above. Before potting it I ran 8 of the cat-eye lamps above. I think the new front lamps use 4 so that's 2x the load. Q1 just barely got warm at 13.8V supply, as expected. I believe the packaging I use here is suitable. A bit unconventional way to do this, but shows how you can toss a couple together with the simplest of containers - aluminum foil shaped over a 1/2 x 1/4 piece of wood. (I used oven foil - a bit heavier). I will mount these directly against a frame member so they can pass the marginal heat on out to the frame. The JB needs overnight to fully harden so I'll post up final results later. Also it is made "surface mount style" but using leaded components that would normally be mounted through drilled holes. I do some surface mount now and then right here at home but only when doing a hundred or more of something. The extra setup is worth it only when the volume gets up a bit. 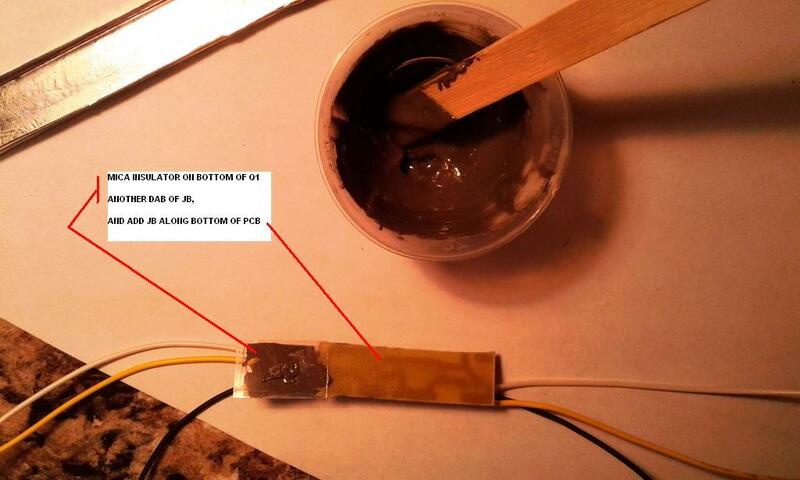 About potting with epoxy. In 1990 I designed and built about 300 battery testers for an R/C motor/battery business. Drained individual NiCd's at 10amps and timed the run down. The guy wanted the circuit potted in epoxy so it would be hard to reverse engineer. I mixed in some alcohol to help the epoxy flow more like paint. The units developed problems due to conductivity in the epoxy - but it was brought on by the alcohol. Set in the Sun for a week and they baked out and worked. But I wouldn't mix anything into the JB Weld - just warm it up and it will flow well enough. (but don't wait long after you heat it - it will start to gel). I want the transistor to have at least some heatsink on the bottom, and it needs to be insulated, along with the rest of the circuit board, from any container. The more traditional "correct" heatsink is a screwed down, or clamped affair of some sort. At maybe 1/4 watt the method I'm using here will work fine, in my humble opinion. That is - a bit of the JB Weld on the bottom of the transistor, then press in a regular mica transistor insulator, then a bit more JB on the bottom of the transistor and smeared all along the circuit board. Could be made smaller but really? Last edited by aquillen; 07-19-2017 at 04:39 PM. for the 10 min I ran it. When t/s stopped it took to long, about 8 sec, to return to white but that is easy resistor change. I like Alex's circuit-very clean . Looking forward to see his results and time delay he has. So I ran my prototype detailed above most of today. It will run about 10F above ambient with 8 lights, using 1/2 Watt, and that would never be an issue. With 4 lamps it would be 1/4 Watt which is negligible. I realized the schematic I posted called for 1/4 Watt resistors, but I did my PCB for 1/8 Watt. So I decided to do a layout for 1/4 Watt and post that. Also to simplify the packaging and build process. During testing at one point I had the 8 cat-eye lights act up, seemed to be related to bumping the module (but it was setting on the bench with the lamps). I did destructive testing on the unit to see if anything had happened inside the epoxy. Nothing found I'm happy to say. Eventually I found that one of the cat-eye's was shorting between the yellow and white wires - inside. This will keep the switchback from working correctly of course. These cat-eyes are very bright and otherwise seem a great light to use, but I'll show you what to look out for - you may get one or more that are not reliable - you can fix or just test and get extras depending on your skills. 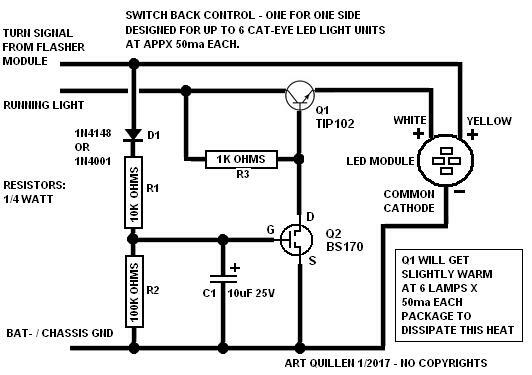 You can test the cat-eyes by power one up with 12Vdc - black = gnd, red - white lamps, yellow - yellow lamps. With one or the other lamps on, avoid both for this test, gently tug and push in on the wire at the back of the unit. See if lights flicker, the other light comes on when it should not. Don't pull too much or you'll have it broken - it's not a sturdy seal in the back. If you pass this test, it probably will be a keeper. Examine the silicone seal closely and if you find a "pin-hole" or unbonded area, work in some silicone seal or dab in some Plio-Bond rubber cement (hardware store item - great stuff to keep around), to build it up a bit. The wire cord going into the back of the cat-eye is marginally bonded with a little dab of silicone seal right at the back. 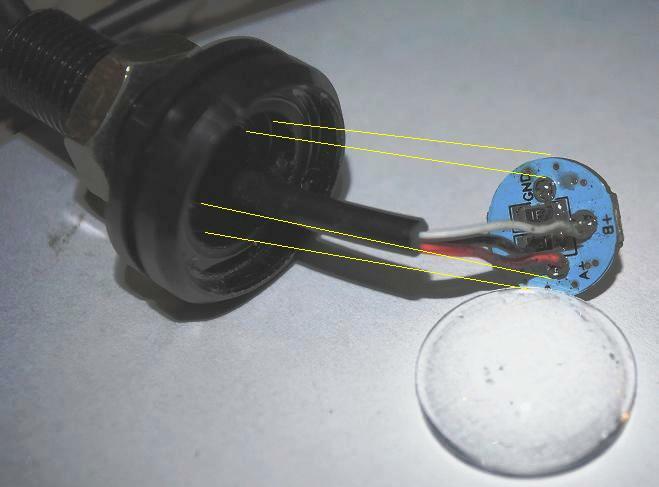 Not much strength to prevent the cable from moving around inside, and it is held in by the small wires soldered to the back of the lamp pcb. The pcb is only held in by the tension of the cable, and is trapped from the front by the lens. It can wiggle if the wires move. It has lumpy solder connections to the wires. Some of the lumps are big enough that when the pcb moves a bit, it may touch the casing of the cat-eye (aluminum). The result in this case was the red and white wires shorting together when the cat-eye was bumped or rattled. You can gently pry out the lens from the front by lifting the edge with a hobby knife. Glue seems better in some spots than others, so try different spots to find one that will let it come loose. Push the wire in from the back and the pcb will come out with the wires. Then you can attempt repairing the solder connections - wick off the blob and resolder it. I cut a small washer from electrical tape and worked it in there too. The clearance in the aluminum hole is so close it is almost a wonder most of them don't short out. But I still like the style and they can dazzle you - bright. Last edited by aquillen; 07-19-2017 at 04:40 PM. Looking good. Hope you'll share too. Guys can build whichever they want. Did a 2nd prototype today using 1/4 watt instead of 1/8 watt resistors - just to follow my schematic above, and make mine a bit easier to assemble for beginners. - see below -art. Build you own switchback - Art's version (continues my original post design up top. So my schematic at the start of this thread called for 1/4 watt resistors. Then I prototyped using 1/8 watt parts because I have bins with about 1000 of each, and as usual was trying to get the board really small - a habit I have. I ran the board all day, packaged up in the epoxy I show above and except for the goofy problem with the cat-eye lights, the board worked great. In the meantime I layed out a board for 1/4 watt resistors simply because they are more likely to turn up at a Radio Shack, etc., and that was what I put in the original drawing. A little easier to assemble. I also wanted to do a package that was easy to do, and had a mounting tab built in. Here is the assembly layout. 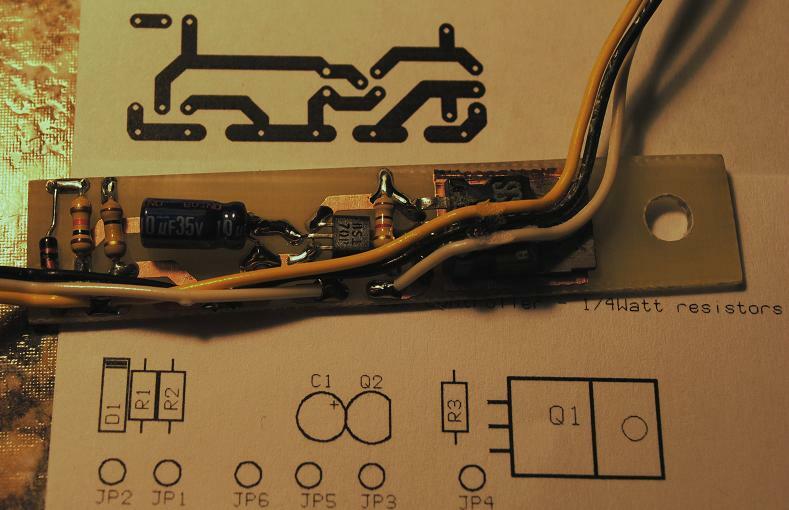 The PCB is 3" long and has a foil block under the power transistor. Hidden under the wires at the right end of Q1, the transistor power tab is soldered to the pcb foil (not a lot of solder, just some in the "hole". Not absolutely necessary but soldering the transistor's large power tab to the foil increases heat dissipation. 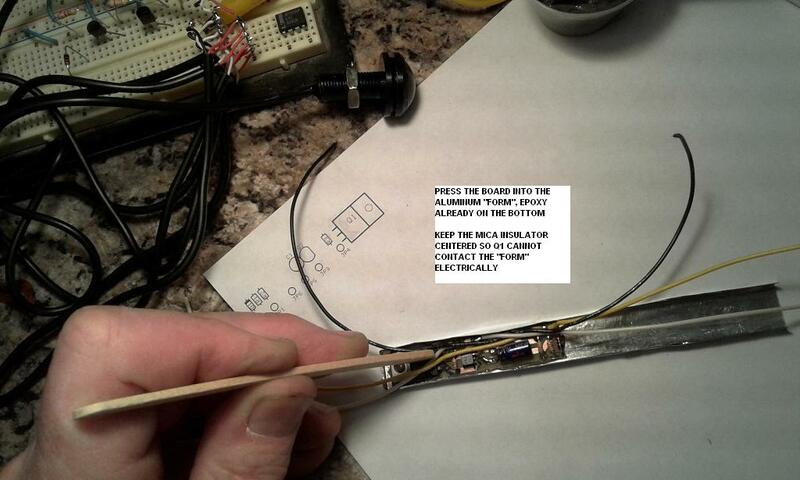 If you do that step and don't have practice doing this - a warning - use a larger soldering iron, sand, scrape or file the tab on the transistor to help the solder flow and bond to the tab, and "get in and out" quickly so you don't cook the transistor with your soldering step. The wires here don't really need to be heavy guage - I'm using #26 which is fine for the LED current levels in this circuit, because it is big enough and I have about a zillion feet of it left from another project. The only good reason for using larger wire would be it seems a poor fit up against the wiring it connects too, which you would likely do near the lamps themselves (but you decide location). But #18 would be as big as I'd go just to keep the bulk from getting difficult to manage. If you are building these on perforated "perf" board and not using a printed circuit board, I'd say just mount the Q1 power transistor so it is close to the surface of your container, with an insulator as I show in the first build above. 1/4 Watt is really very low heat to dissipate - consider those little resistors can do that in open air. If you go with a pcb layout like shown here, the layout view is "from the top looking down" with the intent of soldering the parts on the top, not using the through-hole design. Keep that in mind when making your pcb. The above board was "painted" with JB Weld using a small screwdriver blade and then heated slightly with a hot-air gun to help it flow into crannies and under the wires. A few minutes later it was cool and already hardened enough to handle. The bottom of the board is not coated. The mount hole takes care of how to securely mount it if bolt-in is preferred. Last edited by aquillen; 07-19-2017 at 04:44 PM. Oh - and the delay on my circuit is about 2 seconds after the last blink on time. movement and resultant failure of unit. Thanks for all your work. Yup. I was sitting here thinking about these after I wrote the bit above. I think having one of the lamps go out after getting the entire headlights finally assembled would be a real Debbie Downer. They are nice enough to put up with having to do a bit of product re-engineering so we can trust them. They are so easy to take apart (at least the 1st one was). I'm going to see about taking them apart, and putting something in there to solid bond them. I'm never quite sure which silicone RTV to use - many of the different types will outgas acetic acid as it cures and so corrode the parts. Plio-bond cement is a reasonable material to use, dries pretty fast and has been used for some electronics assembly, and other stuff since at least the early 70's. Cyanoacrylic - super glue - at first thought - decent choice. But would need to give it 24 hours to ensure it doesn't release that white vapor-coating that would spoil the back of the clear lens. I guess one more go-around on the Amazon cat-eyes. They are nice enough and haven't seen another yet to use. So if you get these, to ensure they are reliable you should know about this. I took all 8 of mine apart. Pry out the front lens with hobby knife. Some take persistence, some nearly fall out. Of the 8, the wire/cable was held in ranging from fully filled with silicone to a rubber grommet to peice of foam to almost no silicone. The wiring at the back of the pcb was either very neat ranging to poor solder/bare wire begging to short out. So to have these be reliable, and not have to tear into your lighting later on, you may want to inspect and tune them. Some of them I rewired by soldering off the leads, removing excess solder from the circuit board, and soldering back on after trimming the wires. This is on the smaller end of a soldering job, so be ready with magnifier, small tip iron and a bit of skill. The clearance between the solder points and the inside of the aluminum housing is almost zero - very likely to have contact on some of these and may even be relying on the anodized aluminum to be an insulator. I happened to have some fiber washers of the right size, but you could cut washers from thin cardboard - .475" OD x .2" ID, slit the washer so it will slip over the wire if you don't remove the wires, and solve the problem. Not a fun hour and a half but probably worth it to keep these lights. Last edited by aquillen; 07-19-2017 at 04:46 PM. Here is video of testing a p channel mosfet switchback driver with me acting as a turn signal flasher at various speeds. Hope this works. I used Utube to host. How about using silicone like the one we used on the alu panels all around the car to create a clearance between PCB and anodized housing? And for those without heatshrink to prevent the wires from moving on the back of the housing, maybe some electrical tape rolled tight around the housing and wire will work. When done right it prevents movement. Art mentioned silicone outgases acetic acid which can corrode the connection. I ordered 4:1 heat shrinks, as the housing is 9.7mm and the wire is 3.5 and there are no 10mm heat shrink I could find. I have another solution if I don't get those ebay heat shrinks (75% of my orders since Sept 29 have never arrived). If all silicones use that acetic acid then how do you glue the round PCB back on if using fiber washers? Or maybe you don't need to, you just push it back in? What adhesive do you use to glue the lense back on? Not all silicones release the acid. I THINK you can go by smell - if pungent then probably does. If no odor or nothing burns your nose - probably ok. I used Pliobond for lens. I'd put at least a thick piece of paper behind the board if you have it out. Because just putting silicone or other glue, doesn't keep it from possibly touching some part of the metal case, unless maybe you'd put a skin and let it dry over night. Even a bit of paper then silicone or glue would help prevent a short. Paper spaces it away, the sealant keeps it from moving and touching later. When u buy 4/1 heatshrink u do not need to buy 10mm for a 9.7 hsn. It shrinks a lot so buy bigger so it goes on easier. I bought an assortment from Amazon cause I am here in Fl for winter away from my shop which has lots. Here is the assortment including 1/2 in which fits the 3/8 hsn easy. Last edited by frankc5r; 01-12-2017 at 11:56 AM. Ok we'll see if I can slide them in at 12mm, should work the housing is 10mm. I will cut cardboard washers and slice them in. Not sure yet what I'll use to glue everything back on. Pliobond is freakin expensive cuz only found in USA so shipping is high and I can't really make it under 30 bucks for a small amount of it, if I recall. Will look for a replacement. Maybe krazyglue. Something reasonably close to pliobond is some of the rubber cements for office use - rather similar actually, and the rubber cements for tire patch prep - if it has some filler so it is not just totally runny. Have all parts to make circuit, then will test-expect great results. Given that there are not that many electronics parts used, making a circuit board may be a bit of overkill. I would think that not many people would be aware of an old but good method of making of wiring up a circuit called Wire-Wrapping. Here is a link on how it is done [http://makezine.com/2009/07/27/lost-...ire-wrapping/]. You can buy a hand tool for $15 to $20 and wire is cheep. for a heatsink. To do that requires a bare bottom which is done here by wiring the board as a surface mount rather than the regular wire through board. Put the wire wrap board in a box or insulate the wrap wrap pins poking thru board and that works too.. Many ways to do it. if coupled with paper washer. I expect only a few will have interest in making their own, but would like the PCB. This is an 818 "love project" so what I'll do is this (I've no interest in vendoring here and won't). PM me if you want a couple PCB's. I'll wait a couple weeks and see how many I should make. Takes me an hour to make one or 30 of them, costs just a few bucks at most, and all stuff I have already on hand. In a couple weeks I'll make as many as ask and mail them out in envelopes. Cost is so small I don't care to worry about it. If you want a kit with all the parts, say so, you can see the cost of the mail when you get the package and send that amount back to me. I should hope that would not be considered a vendor activity. I don't want or expect a penny over the shipping. After the good will runs its course I may post up a wish list of 4 or 5 emissions pieces that I suspect some are not using. Maybe that will cover the pay it forward. Don't forget your mailing address. A couple guys have already got parts on the way from mid last week - same deal. Anyway, instead of paying over 40 US to get pliobond into Canada (the one you get for 17 bucks), Art's alternatives made me look into a few things. The tire repair rubber glue and other rubber cement are pretty easy and cheap to find. I wanted to see if there wasn't anything I already had at home. I think this copper gasket silicone may work, it doesn't say there is acid and it BARELY smells, if at all. It's non-conductive too.